7. DO NOT UNDERESTIMATE THE COMPETITION. The other side is frequently operating from a much stronger position than you think. Even if they’re not, they will act as if they are. You need representation on your side who will not be bullied and can level the playing field. You do not build a powerful firm or train exceptional attorneys in just a few years. 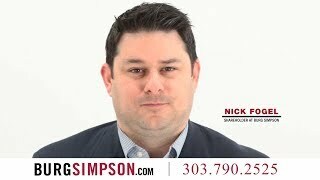 It has taken us more than 40 years to make Burg Simpson what it is today. So clients can rest assured that they are working with a trial law firm that has a wealth of experience on their side. Your recovery will dictate your options going forward. Money never goes as far as you think it will. It is important to look beyond any initial settlement, no matter how enticing it might be. You need expert medical and legal evaluations of your damages, your condition, and what your recovery will entail. Don’t shortchange you or your family. Get as much legal power in your corner as you can — it can make all the difference. 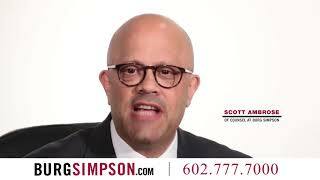 General Personal Injury, Auto Accidents, Unsafe Products and Business Disputes. 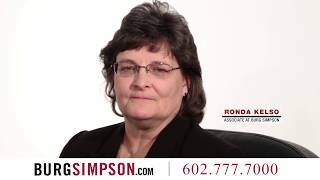 Burg Simpson attorney at law has thousands of other verdicts, settlements and judgments. For more information, please call us at 303-792-5595 or fill out a Free Case Evaluation here so we can contact you directly.